Just a quick post to wish you all a happy and safe New Year's Eve. I will spend the evening doing what I love most. Hooking, watching a movie, sipping a little wine and being with my DSO and the two fur kids. This was a quick hook. It measures about 13" x 13" and was hooked mostly in an 8 1/2 cut. Next month I will learn how to add a braided edge when the Hidden Hills Hookers meet. Oh, my camera is giving me fits tonight. I am pretty sure it is operator error . . . sigh. My snowman mat is nearing completion. I just have this corner left to hook. 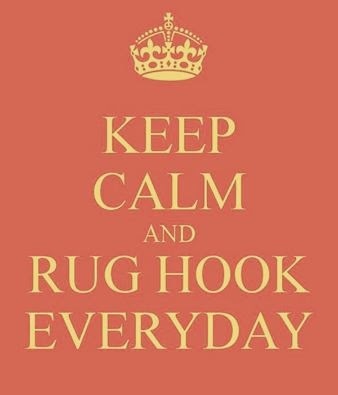 Even when I make a conscious effort not to hook something too large, I have a tendency to hook on the line, which when hooking with a larger cut make an enormous difference. His eyes and nose were just TOO BIG. I think I did more reverse hooking on this little mat than I do on a large rug. Those lumps of coal were just giving me fits. You can't tell by the picture, but I used sparkly grunged white wool for the snowman. It's the first time I've used sparkly wool and I did not care for hooking with it. The weave was very loose and I had a tendency to catch the wool with my hook ~ hence lots of strings to be cut. Just thought I'd share my vintage Christmas books with you. I've had the little Holly Berries book for decades and have no idea where I got it. The others I've purchased over the years. I purchased the Chatterbox because it is dated 1920 and that was the year of my dear mom's birth. As we wind down 2015, I'd like to say a big thank you to all who stop by. I really do appreciate your support and kind words. While many of you are busily putting away your Christmas decorations until next year, this is the time I get to sit back and finally enjoy mine. I must share my birdbath. There is a local man who does stone carving. I've bought a few items from him in the past. When asked what I wanted for Christmas, one of my requests was a birdbath. DSO had one made especially for me. Isn't it just too cool? I've pulled a few loops on my little snowman mat. I'll share my progress in my next post. 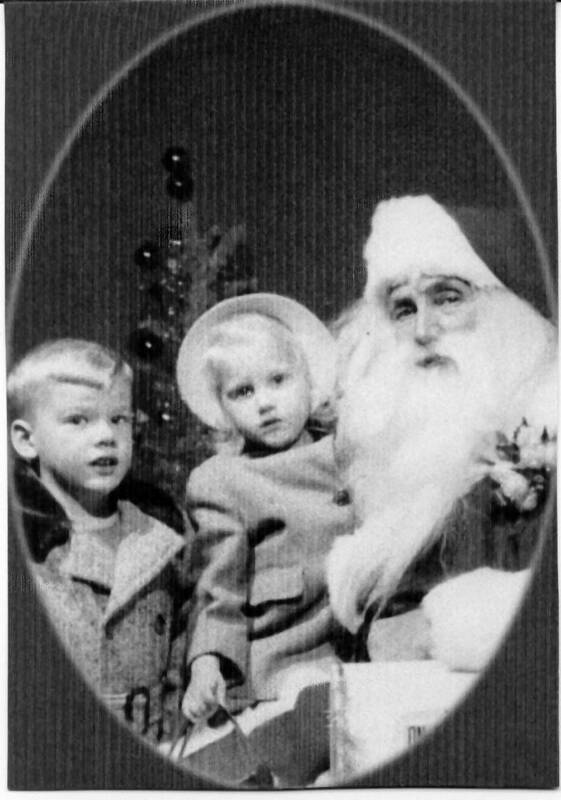 I hope everyone had the Christmas of their dreams. So hard to believe but Ellie came to live with me three years ago today. I guess she was a Christmas present I was not expecting. I know momma Judy (as I refer to her to Ellie) is smiling down on us. Such a busy day trying to get ready for a get-togehter this evening and getting everything done for tomorrow. My gathering will be small, but it will be with family. I've made my potatoes and crab dip. Got out the Christmas dishes and ironed the napkins. Placemats? Well, I've lost the linen placemats I use every year on Christmas day. How did that happen? I've wasted too much time trying to find them so I give up. The silver still needs polishing. I need to sweep & dust. And the list goes on and on. I'm sure in the end it will all be fine. 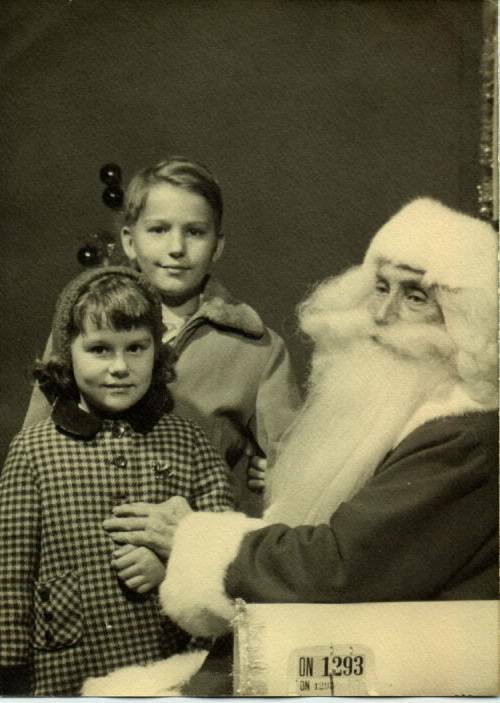 My older brother and me, I'm guessing in 1953. I wish my dear blog friends the merriest Christmas ever. Thank you for visiting my blog, leaving comments and warming my heart. Just popping in for a quick hello. I just had to share my rug finish with you. I am happy to have it hooked and bound. Of course there is no label yet :( The finished size is approximately 21" x 28". The challenge was fun and I'm happy I decided to participate. 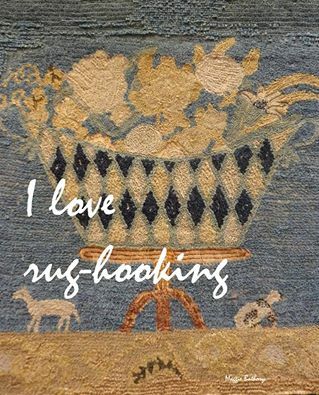 There are so many wonderful rugs that have been hooked. There is much hooking talent out there. I am looking forward to my 4 days off. I know they will be busy, but it will be nice not having to wake to an alarm each day. I am NOT a morning person and the alarm goes off at 5:30. Way too early for me. I finished my Facebook challenge rug today and I'm doing a little happy dance. I bound it in the wool I used for the horse (cut in an 8). It's the first time I've bound a rug with wool strips and I'm happy with the way it turned out and it didn't take nearly as long as I thought it would. I'll share the finish as soon as it gets a final steaming. Here are a few more pictures from around the house. I always struggle over what to use on the dining room table. It's been a year or two since I used the sled. Another cheesy plastic Santa. I think I have 5 of them around the house. I will leave you with this picture of our sweet Loocie. DSO sent this to me at work and it just made me smile. I don't know how she can possibly be comfortable, but she sleeps like this often. As I've said before, how did that happen? The Christmas preparations take forever and the day is over in a heartbeat. This morning I wrapped gifts at Barnes & Noble to benefit Ohio Pug Rescue. The first hour was slow but the pace was picking up when I left at 11:00 and they will be wrapping until 11:00 tonight. 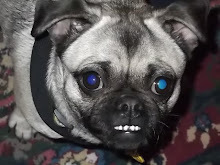 I hope we make lots of money for the pugs. 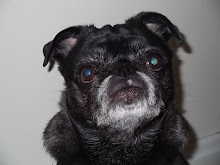 It is an all volunteer organization and every penny is used to help the pugs. Here's my snowman finish. It was gifted this morning. I do hope Dolly likes it. I hooked a smallish version, about 14 1/2" x 14 1/2" and sewed a rusty jingle bell to the hat. A few more peeks at my decorating . . .
Off to get grandson so he can wrap presents then it's on to a local train display. I finally got my Kelley Belfast snowman bound this evening as he needs to be completed by this weekend and tomorrow night after work I'm off for my annual mammogram and then to another Christmas with DSO and his family. Saturday morning it's off to wrap gifts at Barnes & Noble to benefit Ohio Pug Rescue. We do very well and last year broke the $1000 mark in donations. Such a busy time of year. I think (HOPE) I bought my last present this evening, but I need to check my list to be sure. Since I only have one grandchild, every time I am shopping I seem to find something else for him. That's what grandmas are for, right? Here's a picture of the backside - bound in the background wool. I'll share a picture of the front after he gets a light steaming and his rusty bell added. I'll have to add a label at a later date. Next up is binding my challenge rug . . .
. . . so that I can start another little snowman mat. (Pattern by Katie Alman ~ Kid'l de Divey Woolens.) The Hidden Hills Hookers meet monthly. 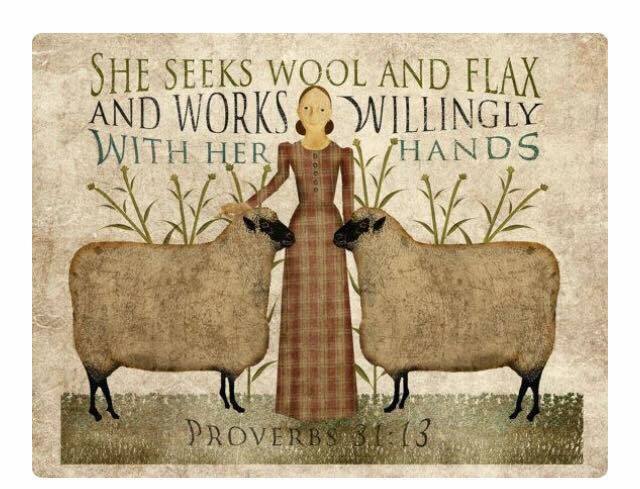 This is an optional pattern to hook and then in January we are going to learn how to finish a rug with a braided edge. I've seen it done before, but have never done it. I bought some grungy sparkly wool to use. That will be a first for me. 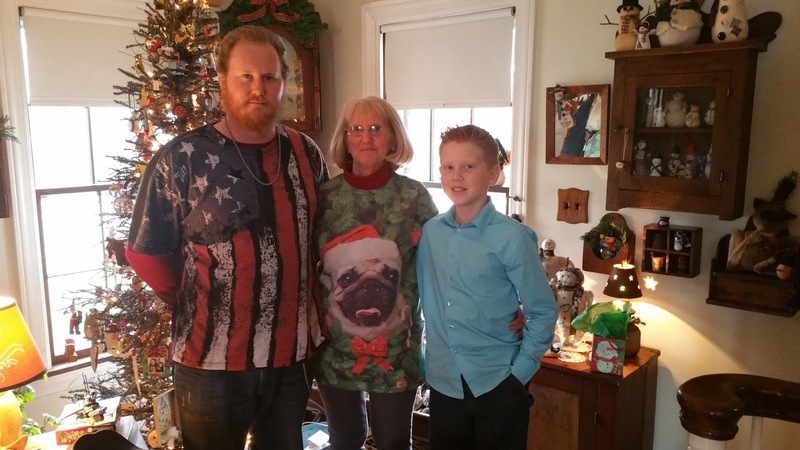 Here are a few of our overachievers who had theirs already hooked when we met in earlier in December. 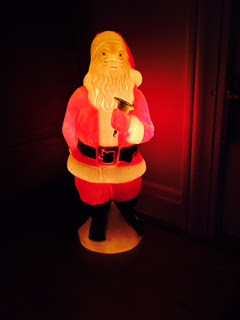 A cheesy plastic Santa in my hooking room . . .
. . . and a tinsel tree with only lights. A surprise was in my mailbox this week. This darling cupboard tuck smelling of balsam. Sweet, isn't it? Thanks so much Debbie. You made my day.